DRW Magazine (www.drwmag.com) was on hand for the Kids Can Houses for Change event and published the following article in their January 2014 issue. Special thanks to Jared Blaunt, owner and editor of DRW Magazine, for allowing us to post the article in its entirety. With stickers, crayons and markers, several dozen children delicately designed small house-shaped cardboard boxes recently, in an innovative effort to help other children who don’t have homes at all. Once designed the boxes were to be used as collection boxes, which when full were to be donated to two local non-profits that help homeless families. “We are doing it to make a difference in people’s lives and let them do the things they want to do,” said Logan Bratter, a 2nd grader from Cooper City. Not only was Bratter one of the home designers, he is also the Chairman of the Board of the Kids Can Foundation, the local group that organized the Houses for Change fundraiser. More than 50 youngsters turned out at the David Posnack Jewish Community Center in Davie on December 8th to help build and create the Houses for Change. The houses and the art supplies were provided by Kids Can; the young do-gooders needed to bring only their ideas and imaginations. The concept behind the Houses for Change is to let kids with homes help those without, said Mark Wasserman, the founder of the project. “The kids are learning that they can make a difference no matter how young they are,” he said. Wasserman developed the project three years ago while volunteering with Family Promise, a national non-profit organization which helps homeless families get back on their feet. Since its inception, Houses for Changes has encouraged 30,000 children to raise $400,000 for charities of their choice. The money collected in the Davie project will go to Broward Outreach Center and Family Promise, the national sponsor of Houses for Change. “This is the sweetest thing I have ever seen. I have done this for ten years, and this is the first event of its kind. I am very touched,” said Nina Corbe of the Miami Rescue Mission, which operates the Broward Outreach Center. Made up of kids between the ages of 1-16, the Kids Can Foundation is based on the concept of kids helping kids. Just past its first anniversary, the group got its start when Logan Bratter came home from a violin lesson one day and asked his mother if all kids were lucky enough to enjoy music lessons and other after-school enrichment. “She said some weren’t and I wasn’t okay with that,” said Logan. Working with several other local families since then, the Kids Can Foundation has held seven or eight fundraisers, including making sandwiches for homeless shelters, coloring events, a 5k run, and an event with Young at Art. “We started doing little projects, and it took off from there,” said Rebecca Bratter, Logan’s mother. The foundation’s goal is to teach children how to be good members of the community and learn how to give back. Bratter says they’ve raised close to $10,000, and have already made scholarship donations to provide music lessons to students who otherwise couldn’t afford them. 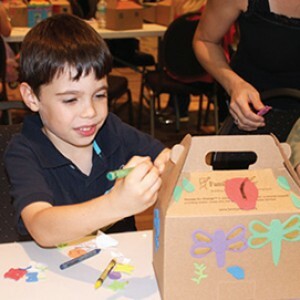 The foundation was also partnering with the 2nd graders of the University School of Nova Southeastern University to decorate boxes to fill with toys to bring to a local children’s hospital. For more information on Houses for Change, visit them at www.HousesForChange.org. Kids Can is based on the concept of kids helping kids. Our mission is to unlock the potential in our children by empowering them with the opportunity to give back to the community and enrich the lives of children who may be less fortunate.